Auckland, New Zealand – 20 March 2015 – The last year saw New Zealand’s interactive games industry soar by 18 per cent to a value of NZD$347m off the back of a strong increase in digital sales. 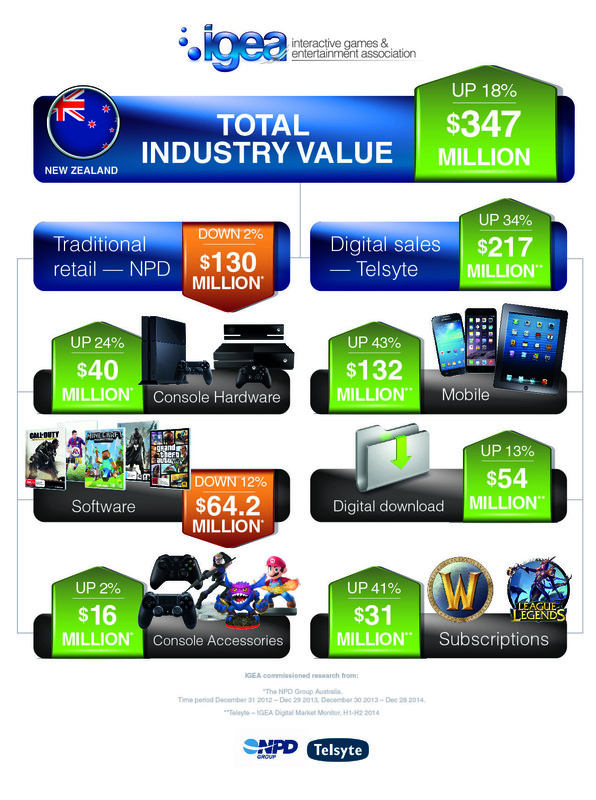 While traditional retail purchases remained largely static, showing only a slight softening of 2 per cent to NZD$130m, this was more than offset by a massive 34 per cent jump in digital sales to NZD$217m, according to research released today by the Interactive Games & Entertainment Association (IGEA). * Source: The NPD Group Australia. The IGEA is an industry association representing the business and public policy interests of New Zealand and Australian companies in the computer and video game industry. IGEA’s members publish, market and/or distribute interactive games and entertainment content and related hardware including mobile and handheld games.